Today’s sedentary desk jobs hurt worker health and productivity, yet employees and businesses alike don’t fully understand the short- and long-term risks associated with a sitting culture. As pressure mounts to implement company wellness programs, it’s more important than ever to create a culture of movement to preserve and improve worker health and well-being. 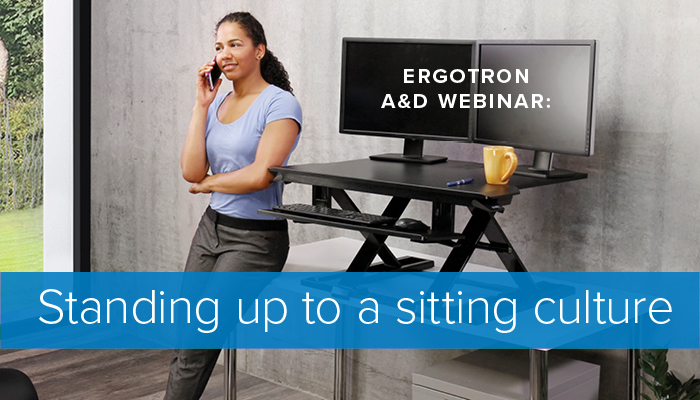 This recorded session hosted by Ergotron’s Wellness Market Manager, Betsey Banker, CWWS, CWWPM, will arm you with information to lead the conversation about sit-stand furniture. This webinar is ideal for architects, designers and space planners.